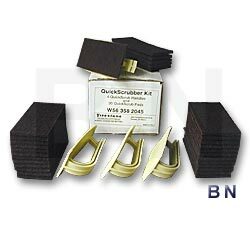 The Firestone Quick Scrubber Kit includes 30 scrub pads and 4 holders that allow the installer to apply QuickPrime Plus when seaming two sections of PondGard EPDM liner. Attach the pads to the holder quickly and easily using the small securing hooks on the bottom of the holder. Made in the USA. Microbe-Lift Soy-Based Cleaner for Rubber & Plastic, 32 oz.